It doesn’t matter if you're writing a 70,000-word novel or a 600-word picture book you have to create a story with a good plot and that's well paced. 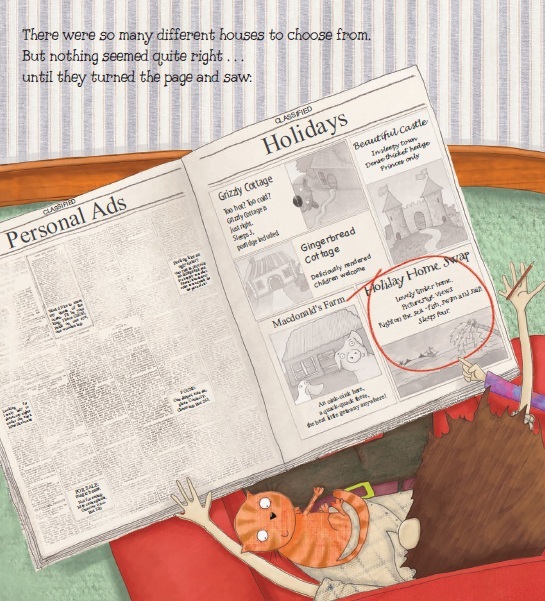 Unlike a novel when writing a picture book you know how many pages you are working with as there are industry standards.The picture books I write normally adhere to the traditional 12 double-page spread formula. So when I start to work on a new story I take a piece of A4 paper and fold it to create 12 sections. To show you how I use this piece of paper to pace a story I'll describe how I wrote Captain and Nugget. 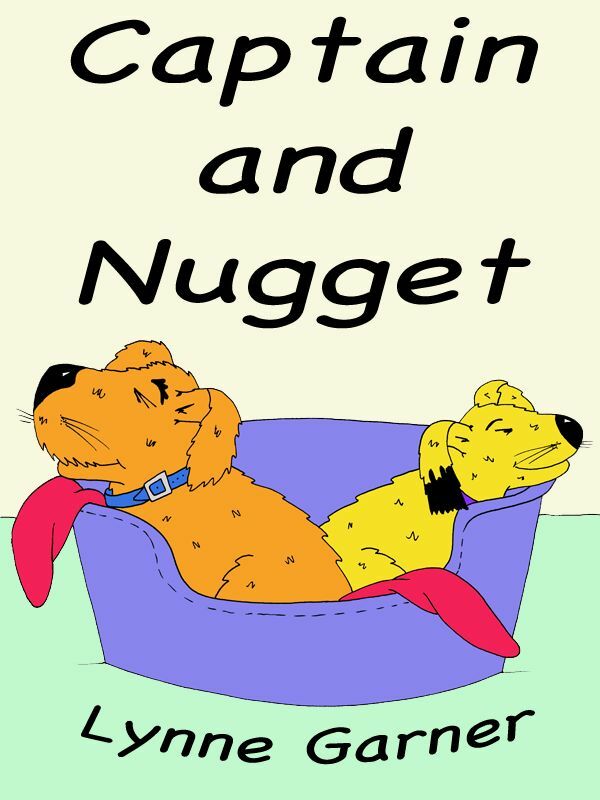 I knew the story was going to be about two dogs, Captain and Nugget. I had decided the theme was going to be about learning to share and I knew how this lesson was going to be learnt. So all I had to do was pace the scenes on my piece of paper. On the first page I introduced one of the characters, being Captain. 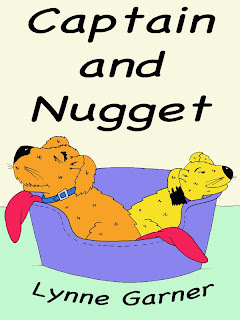 The next page I used to introduce both the second character, Nugget and the problem, Captain learning to share. I then skipped to the last page because I knew I wanted a happy ending with Captain realising that sharing has its benefits. 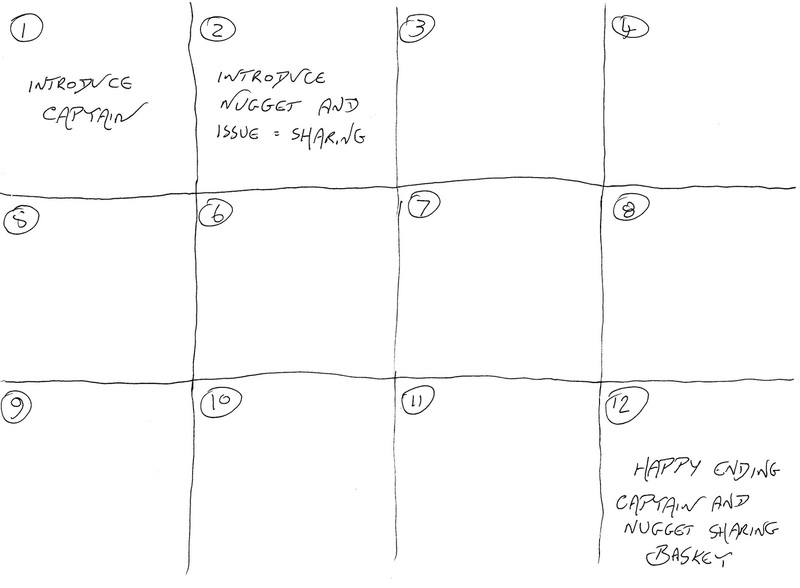 So by plotting the first two pages and the last I was left with nine. Having nine pages meant I was able to use the magic number three. Basically for an interesting story you can't have your character solve the problem on the first attempt, this would be boring. You shouldn't allow them solve the problem on the second go, you've not built up enough tension. Having them continue to fail would frustrate the reader so you need them succeed on the third. So I was able to split the nine pages into three sets of three, which allowed me to evenly pace the story. I've used this method of pacing in many of my books and I'm sure I'll continue to use it, as it appears to work for me. 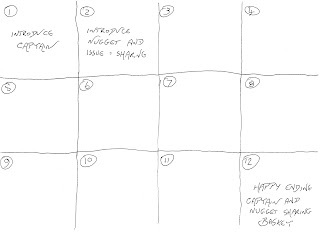 In fact just this afternoon I grabbed my A4 note pad, created 12 sections and started to plot and pace out a new story. When I'd finished this story I used it as part of an illustration course I was studying and at that time I also decided to turn it into an eBook (Amazon.com - Amazon.co.uk). As I no longer had to stick to the rigid 12 double-page spreads I increased the pages to 23 and was still able to create a story I felt was well paced. 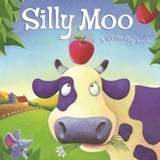 I've had a few picture books published over the years but my most popular one, a lift-the flap book called Silly Moo! almost never got published. It looks harmless enough, doesn't it? Yet several publishers thought the story was too dangerous for small children. I can see your brain ticking here. What on earth did the cow get up to? Did she drive off with the farmer's tractor and crash it? Climb the tree to pick the apples? Go ice skating on the lake? Nope. The basic story plot is that an apple falls out of the tree onto Cow's head and she forgets where she lives so wanders around the farm trying to get into the other animals' homes. They all get fed up so decide to drop another apple onto Cow's head hoping she'll get her memory back and remember where she lives. Editor (on phone): We really like this story and would like to publish it. Me (getting excited): Oh, that's great. Editor: We need to change it a bit though. Me (a bit wary): Really? In what way? Editor (firmly): Well, it's far too dangerous. Me (puzzled): Dangerous? (wracks my brains) I don't understand. What's dangerous about it? Editor: Well, the apple falls on the cow's head. That's very dangerous to have something falling on someone's head. Me (baffled): But apples do fall out of trees. Editor: And later on in the story the hen drops the apple on the cow's head again. Me: Er, yes...but it's just an apple. Editor (sternly):What if the children copy it and go around dropping apples on each other's heads. It's very irresponsible. Me: I'm sure they won't. Editor (very firmly): We can't risk it. it's far too dangerous. We need to change it. Me: But it's vital to the story. I need the apple to drop on Cow's head so that she gets a bit fuzzy-headed and forgets where she lives. Now I think that sounds far more dangerous than an apple falling on Cow's head! Similar versions of this conversation was repeated by several mainstream publishers over the next couple of years. I'd almost given up hope of getting Silly Moo! published when the wonderful team at Top That Publishing said that they didn't think an apple falling on Cow's head was dangerous at all, suggested making it into a lift-the-flap book and published it. Now I know that we children's authors have to write responsibily and be aware of the young age of our readers but I honestly think that sometimes the 'gatekeepers' can be too cautious. What do you think? Have you ever had a picture book turned down because it's too dangerous, not politically-correct or 'unsuitable' in any other way? Neither is it a blog about sprouting a set of beautiful feathery wings - in case you had that in mind - which is probably just as well. I imagine it would make getting dressed a real problem! I wanted to tell you about how a book, or a series, can grow wings and take off ... often way beyond our expectations! This week the 10th book in the Hamish McHaggis series (Hamish McHaggis and the Great Glasgow Treasure Hunt ) will be ready to be sent off to the printers. The book won't be launched until later April 2012 but it is so exciting to have arrived at this final stage. It is wonderful to be back working with Illustrator Sally J. Collins and I know that neither of us thought, when we started working together in 2004, that it would be the start of such a wonderful and exciting journey. We have a lot of fun with the characters (Hamish- a cuddly haggis, Rupert- an English hedgehog, Jeannie- a rather dippy osprey and Angus- a cheeky pine marten.). There have been some exciting book launches in amazing places such as Edinburgh Castle, The Falkirk Wheel, Stirling Castle, Glamis Castle and even at Balmoral, and this year we will be launching the latest book in Glasgow's famous Kelvingrove Art Gallery and Museum. Sally and I work closely together and as soon as I have an outline for the story she begins to sketch out some ideas and work up any new characters. 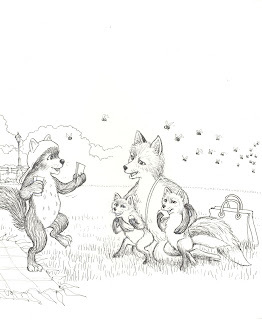 In this book we have an urban fox (Maggie) and her little fox cubs so Sally immediately began to work on getting Maggie just right. Our animal characters don't wear clothes but they do have accessories, such as Hamish's tartan tammy and Angus has his red cap. Rupert often wears his glasses and he has a camera and binoculars. Jeannie the osprey likes to wear pink beads and for this book she is sporting some new beads with a Rennie Macintosh style rose on them. 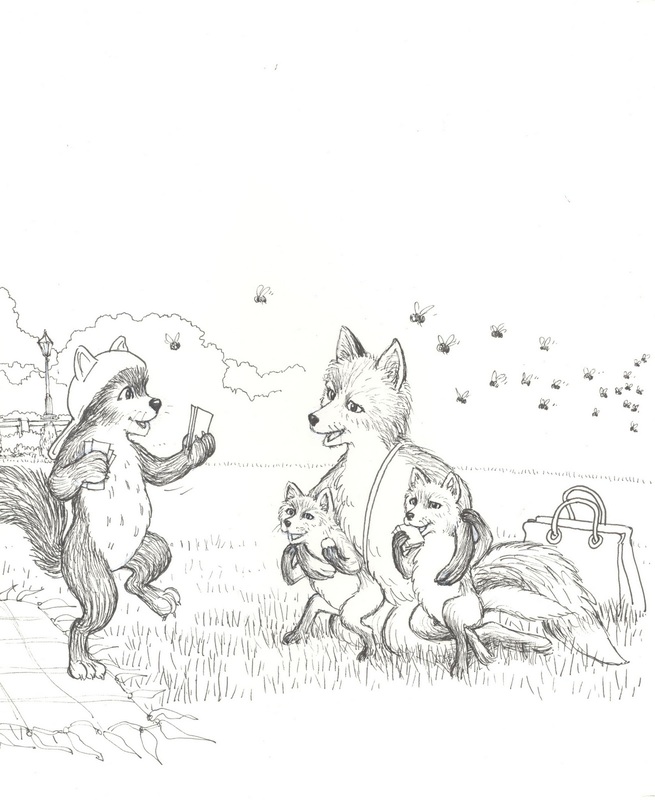 So, as you can see here, we decided that Maggie the fox would have a handbag! Once the story is complete Sally and I discuss each spread and nothing is set in stone until we are both happy with it. What works so well for us is the way we get to bounce ideas off each other, right up until the book is in the final stages. 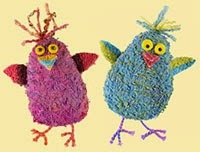 When I speak to people about writing picture books I think this is how they imagine most authors and illustrators work. But I am fairly sure that we are in the minority. I have written a fair number of highly illustrated books but I have never met or even been given the chance to speak to any of the other illustrators while the book is in progress. So working with sally is a completely different experience and one I enjoy. One reason that it works so well is because we actually live quite near each other and can meet up regularly to exchange ideas, but also because we respect each other's opinion and expertise. 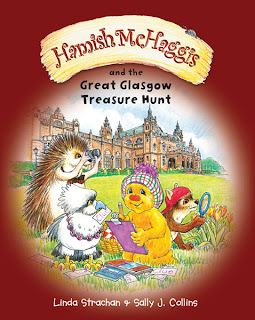 Sally and I were absolutely delighted when Scottish Book Trust (SBT) developed a set of teacher resources based around the Hamish books. Sally and I went through the books and listed some of the things we thought would be of interest and the lovely people at SBT added other ideas and also gathered material devised by some very enthusiastic teachers, as case studies, to provide these wonderful FREE downloadable resources for teachers. I have always found it fascinating to see how much I discover about each new book. It can be startling what you can find in a story to work with, and I often find things that I had never really thought about when I was writing it. This becomes even more obvious when the time comes to think about how I am going to present the book to children. One of my favourite things about making picture books is creating a world for the reader to delve into. I love inventing a fully rounded character and giving him/her a home, a job, friends and hobbies. Ideally, I want readers to bond with my character and know all about him/her, but I frequently run up against my evil enemy Mr Word Count Limit, so I have had to think of cunning ways to get around him. 1) Use illustration to develop character. If I don’t have the word count to talk about my character’s mum, I add in a photo in a frame in the background. 2) Hide extra characters or snippets of story in the images. My character has a whole host of friends in the background, getting on with their lives and I love the idea that a child will get joy out of suddenly noticing an extra character or funny antic (the Richard Scarry effect.) 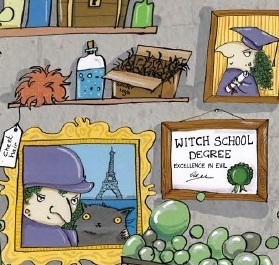 A quick way of doing this is to use characters who are already well known, for example in the background spreads of my Fairytale Hairdresser book, I used familiar nursery rhyme and folk characters. 3) Use illustrations to create juxtaposition with the text, for example the text ‘no one could see the wolf’ could be accompanied by a drawing of the wolf hiding behind the tree. Children love feeling clever and being the one to spot something the characters in your story can’t. It helps them feel like they are really inside the world. 4) Don’t forget the grownups. They will be reading your story for the millionth time (hopefully) and it by then they might be very bored (I speak from experience). 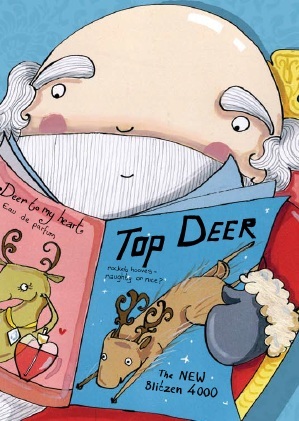 Put something in for the parents too – an extra detail or a textual joke in the illustration could really help when reading the book aloud at the end of a long day. 5) You can even use one book to give a clue about another. In this spread from Pirate House Swap (illustrated by the wonderful Mark Chambers), one of the ads on the left is for the Fairytale Hairdresser. Why are pictures so vital to this particular story? Well, one of the glories of pictures is that even very young children can ‘read’ them, long before they can read text. Children study pictures in picture books and see for themselves what is happening, and they notice when what they see does or doesn’t tally with what the book’s words (read out loud by somebody) are telling them. 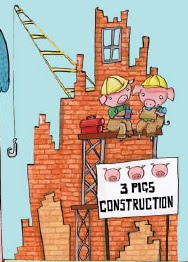 There is wonderful potential excitement created when there is a deliberate gap, or even a contradiction, between words and pictures, because a child can, and will, fill that gap with their own deductions … that apparently nobody else has noticed! The child audience can know more about what is really going on in the story than the words tell. They can know more than the adult reading those words seems to know, and certainly know more than the characters living the story know. That knowing and understanding leads to anticipating possibilities that make the child an essential co-creator of the overall story, along with the author and illustrator and designer; the story is their story too. We can see exactly why Little Nelly thinks that she is a mouse because we can read the book that tells her that mice can be grey, and that they have big ears and skinny tails. Nelly has ticked all those things. She’s been quite logical in working out that she is a mouse. 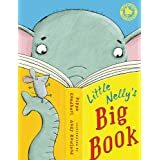 The text tells Nelly’s point of view, but looking at the pictures we know that she’s got it terribly wrong because she isn’t a mouse at all, and an elephant is very different from a mouse! What in the world is going to happen to her now that she thinks she is a mouse? Read the book, and find out! Sometimes, I go along with them: "Oh yes - I have an altogether happy disposition and love ALL babies - even when they scream." But sometimes, just sometimes, I feel the need to tell the truth! My rhyming picture books aren't the product of sugar and cuddles. Oh no. Far from it. My picture books are always induced by .... TRAUMA. Not a fluffy pink rabbit in sight! 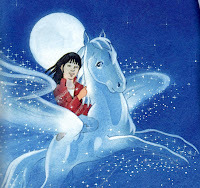 Take, for example, my first picture book (Ooh, that sounds a bit vain! Forgive me: 'trauma gives rise to mediocre things' doesn't really work ). Anyway, I was suffering (nay, nearly dying) from heat-stroke on the 10th floor of an apartment block in North Africa - and the temperature had just reached 50 Degrees Celsius! I repeat: 50 DEGREES CELSIUS! (I don't care if that was in 'the shade'. We hadn't been in 'the shade'.) And we couldn't get out because we were on the edge of a busy city and exit routes were blocked by forest fires. Though I like to think of myself as a bold explorer, my delicate constitution is not made for such temperatures. Whilst everyone else was coping admirably, I was most certainly not. Friends sipped mint tea in an adjoining room whilst I panted and gasped for breath. To be honest, I wasn't at my most glamorous either. You see, thanks to the kindness of a woman called Zarfa, my clothes were stuffed with bags of frozen chickpeas and my feet were in a bucket of mineral water. (The taps had all run dry). But just when the situation seemed hopeless, something wonderful happened. You guessed it: the MUSE arrived!!! And my brain wouldn't stop ..... my first ever picture book was born! Now, I'm still sworn to secrecy - but think heroines stuck in towers - desperate to get out and fed up of waiting for a prince. (Oh, and I should point out that she doesn't die of heat stroke or fill her top with frozen chickpeas). Of course, I had to rework it (again and again and again), until it finally went 'click'. But what I produced was really rather nice and publishers actually loved it. 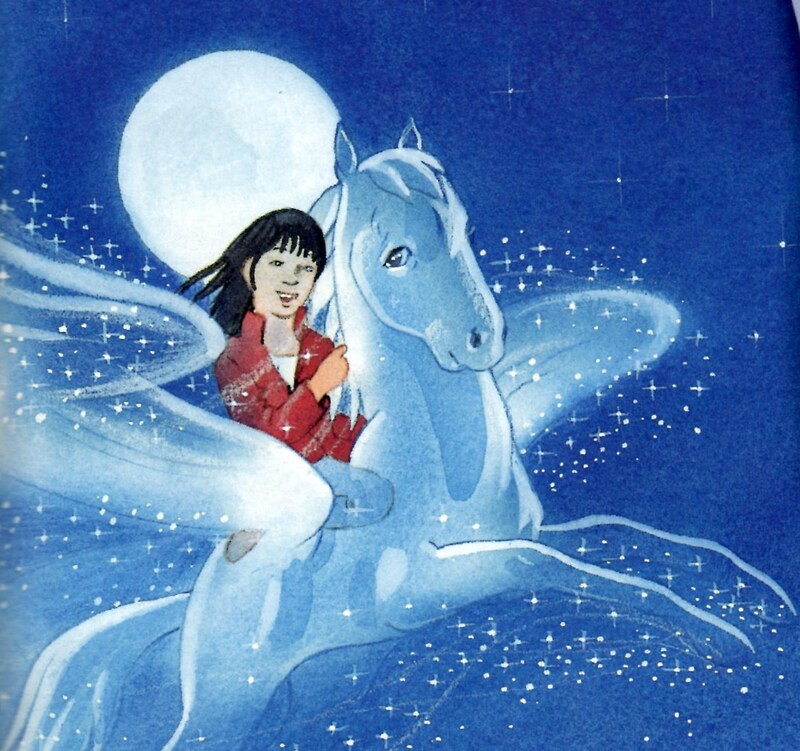 In summary: without a bit of trauma - my picture book career would never have begun. It was worth it - frozen chickpeas and all! 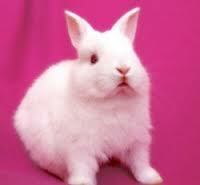 So you can keep your fluffy bunnies: we don't need them. Picture-book writers prefer to live on the edge!